Vitamin B6, also called pyridoxine and pyridoxal 5’ phosphate, plays a role in the synthesis of proteins and neurotransmitters, formation of red blood cells and fat metabolism. Vitamin B12, also called cobalamin, supports the maintenance of your nervous system and development of red blood cells and DNA. 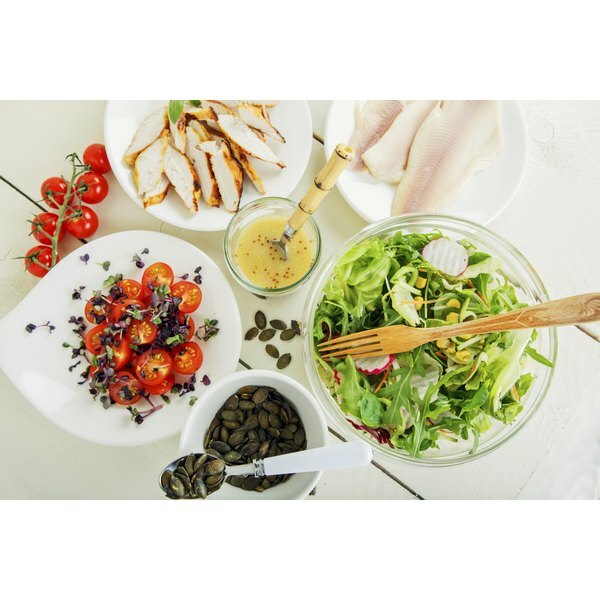 Consume a balanced diet of healthy foods, for the best source of vitamin B-6. Good sources of vitamin B-6 include fresh fruits, green leafy vegetables, whole grains, cereals, legumes, fish and poultry. The recommended dietary allowance for vitamin B-6 is 1.3 milligrams per day for men and women ages 19 to 50 years and 1.7 milligrams per day for adults ages 51 years and older. Cooking foods can reduce the available amount of vitamin B-6. Taking certain drugs, such as isoniazid and L-dopa, can interfere with the metabolism of vitamin B6 and may require that you increase your intake of the nutrient through food or supplement. Vitamin B-6 supplements enable you to obtain the required amount of the nutrient if you consume insufficient amounts from the foods you eat each day. Nutritional supplements may contain higher amounts of vitamin B-6 than the recommended daily amounts. Even though vitamin B-6 is water-soluble, you can increase your risk for certain conditions if you consume too much. Research by scientists at Wageningen University in the Netherlands and published in "Nederlands Tijdschrift Voor Geneeskunde" in 2005 reports that taking 1,000 milligrams or more of vitamin B-6 per day, about 800 times the daily intake from foods, can cause nervous system damage. The research also reports two cases of toxicity as a result of taking 24 milligrams and 40 milligrams of vitamin B-6 per day. Sources of vitamin B-12 include animal products, such as shell fish, fin fish, meat, poultry and dairy. Adults require 2.4 micrograms of vitamin B-12 per day. You may need to consume higher amounts from foods as you get older because your ability to absorb the nutrient diminishes as you age. Vegans are susceptible to vitamin B-12 deficiencies and may require taking nutritional supplements. You can find vitamin B-12 in a variety of nutritional supplements that include multivitamins and B complex vitamins and products containing just vitamin B-12. These products come in tablets, capsules, soft-gels and lozenges. Vitamin B-12 also comes in injectible form. Vitamin B-12 may interfere with certain drugs that treat cancer, seizures, diabetes, ulcers, gout and infections. Consult your doctor or pharmacist before taking vitamin B-12 supplements. PubMed.gov: How Much Vitamin B6 Is Toxic?